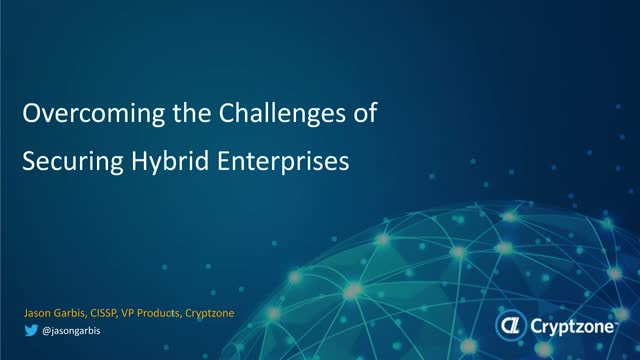 It’s become clear that organizations need to overcome the challenges of securing hybrid enterprises. Hybrid IT spans platforms, tenancy and locations, which when using traditional solutions often results in a fractured security architecture without a centralized single policy, view or enforcement point. With this shift to hybrid, organizations need to embrace CSA’s Software-Defined Perimeter (SDP) specification to enable a new, transformational approach. Using SDP results in precise network security, automated network policies, reduced compliance effort and reduced attack surface. In this session, we’ll summarize the progress that’s been made with the CSA’s Software-Defined Perimeter (SDP) specification over the past two years, and show how and why an SDP approach enables organizations to overcome the challenges of securing hybrid environments. We’ll conclude this session with a case study, showing real-world benefits achieved by enterprises that have deployed an SDP architecture.